Sonia is Director of Climate Change at the Children’s Investment Fund Foundation (CIFF) where she oversees the energy portfolio, with a particular emphasis on China and Latin America. Prior to joining CIFF, Sonia co-founded and acted as COO of a start-up company with a mission to connect Africa to the green energy economy by developing high-quality biomass supply chains deriving from existing plantations in West Africa. Previously, Sonia worked at EcoSecurities, one of the largest carbon offset project developers in the world, from its start-up phase through to its acquisition by J.P. Morgan & Chase in early 2010. During a seven year period at EcoSecurities she held the position of US Country Director based out of New York and before that Global Head of Origination managing 20 local teams on five continents. Prior to joining EcoSecurities, Sonia worked on climate change and energy issues at the United Nations Environment Program in Paris. 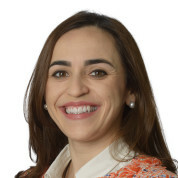 Sonia holds a BSc in Environmental Sciences from the University of Madrid, a MSc in Environmental Change and Management (specialization in Energy and Economics) from the University of Oxford and an Executive MBA by the London Business School. In 2009, Sonia was named a World Business Council for Sustainable Development Future Leader and in 2014 a World Economic Forum Young Global Leader. "I still remember my teacher from first grade. A great teacher is unforgettable. A remarkable outstanding teacher, like the ones the Global Teacher Prize recognizes, are not only unforgettable, but have the capacity to change peoples' lives and that positive impact to have a long-lasting multi-generational effect."